Bias: Fixed w/ bias adjustment pot. I just acquired a 1965 Pro Reverb in mint condition. There is no amp like it. Full sound with two 12 inch speakers. Greatest reverb I’ve ever heard. Why don’t they make amps like this anymore? I’ll have this amp ’til the day I die. It’s so great, I’ll will it to my nephews. I found a Pro Reverb at a rummage sale that they were going to throw away – put some tubes in, and it’s great! The speakers need refoaming, though. From what I can tell they are Altec Lansing D120F – it’s hard to see, because the label is scratched. 1.) rectifier/B+ supply. The aa1165 Pro is a GZ34 tube rectifier, while the aa1165 Bassman B+ is solid state. This means (among other things) a different mains transformer! 3.) The tone circuit voicing for the normal channel Pro and bass channel Bassman are vastly different. 4.) The stock vibrato circuit in a Pro substantially affects total circuit gain, compared to the normal channel of the Bassman. I agree with you, these are both great amps. However, based on these and other differences it is simply not accurate to say that he Pro is “…essentially a Bassman in a combo with reverb…” Unless you are also willing to say the same thing about any Fender with two 6L6 power tubes, 12AX7 preamp tubes, and fixed bias. I’m pretty sure Utah speakers were also used in Pro Reverbs in ’65…Pro Reverbs to me always had a ton of low end and is also a very loud amp. This was my initial impression. When I learned later that Pro Reverbs have the AA165 circuit (not the AB763) then it all made sense. The AA165 circuit is the circuit used in Bassman heads — which are also real loud and FULL of low end. 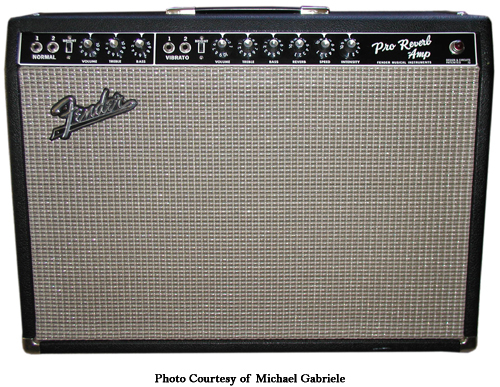 The Pro Reverb is essentially a Bassman in a combo with reverb. Not as sweet sounding as the AB763 reverb combos, in my opinion, but a solid choice for loud Rock and Roll, just like a Bassman. Takes pedals great. I am playing a 64 blackface pro with celestian cream speakers…delicious tone!